Small group training that will have you laughing from the start. Laurie Polich and The Skit Guys combine forces to bring you a quick, no-frills, everything-you-need-to-know-and-not-do video for leading a small group—comprehensive yet quick, fun, and easy to learn from. One of the most important elements of a youth ministry is the small group. Finding leaders who are capable and confident to lead those small groups is no small task. But now you can be sure that your leaders are effectively trained (and even entertained) with Help! I'm a Small-Group Leader! Training Video. You’ll find that training small group leaders has never been so easy or so much fun! The comedy of The Skit Guys, combined with the small group expertise of Laurie Polich will set your leaders up for success as they learn the do’s and don’ts of small group leadership. From skits with everything from “bad leaders” to “problem students,” the Skit Guys portray eleven scenes that will have leaders laughing and learning. 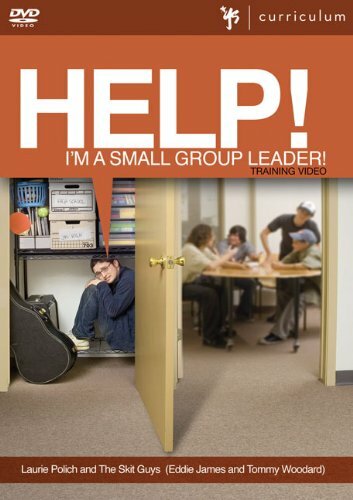 This DVD gives your leaders everything they need to take on the challenge of leading a small group of students, as Laurie provides practical training that will help your leadership team understand how to better lead teens in small groups. Based on the bestseller, Help! I’m a Small Group Leader, you’ll find this to be a great resource for use with your volunteers and youth ministry team.